Luci Barker: Revolution Skincare Haul + My Thoughts! 'Another haul?' You might be thinking. I was going to include these Revolution Skincare products in my previous haul, but I wanted to talk more in depth about them and also review them at the same time. 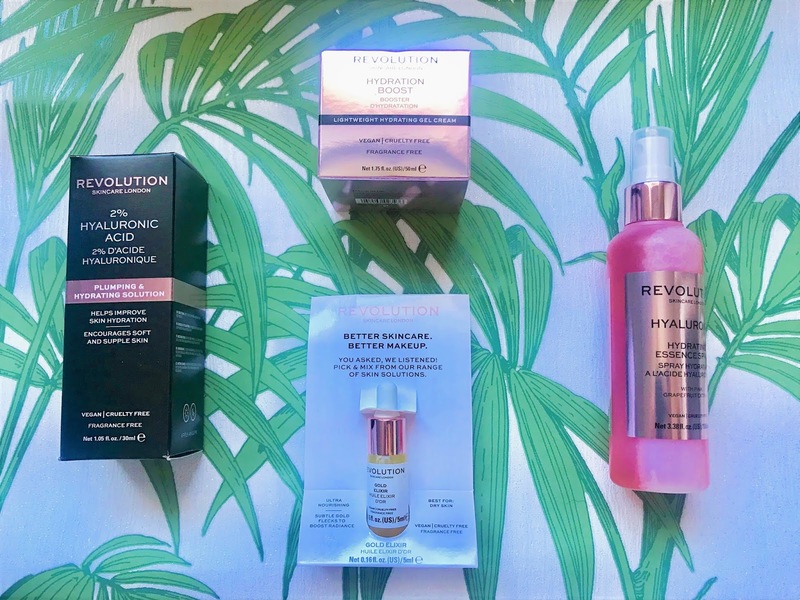 If you've read my blog before, you'll know that I absolutely LOVE Revolution products, but I just hadn't tried any of their skincare products yet. A few weeks ago, I saw that they had release the new Hydrating Essence Sprays and I'd just ran out of my Mario Badescu Facial Spray and needed a new one, so how about that for timing eh? The first product I picked up was the Hydration Boost Moisturiser. I have had my eye on this for quite a while due to hearing lots of good things about it and I finally decided to pick it up this time. I love using gel creams, because they work really well with my skin and as they're gel based they sink into the skin easily, without making you look or feel oily/greasy. For someone with combination skin, this works perfectly because it doesn't add any extra oils to my oily areas, but still re-hydrates the dry patches. The ingredients also include Hyaluronic Acid which works to re-hydrate dry, dull skin and is also really good for fine lines and wrinkles. For just £8 you get a decent 50ml pot of product and because a little goes a long way, this will last a decent amount of time. I would personally compare it to the Boots Tea Tree & Witch Hazel Berry Jelly Moisturiser, which I'm sure you've all seen me talk about many times on my blog. I then came across the 2% Hyaluronic Acid Plumping Serum, which I didn't actually know they did, but I swear by Hyaluronic Acid (you can probably tell by now anyway!) and also serums are really good to add to moisturisers so I thought I'd try it out. Serums are really good to put on overnight because it gives it time to sink into the skin and really work its magic! I just mix this with my moisturiser and BAM it get's to work on my skin. This is just 2% Hyaluronic Acid, which is a decent amount because obviously a high amount of acid directly on your face wouldn't be a good thing, I would've thought anyway. I believe you can also get a 5% serum as well. I stumbled across the Hyaluronic Hydrating Essence Spray on Instagram, when it was first released and as I was in need of a new facial spray it just seemed like the perfect time to try this one. I didn't actually realize how much I actually use Hyaluronic acid, but there's that. I find facial sprays perfect as they're really hydrating and refreshing and this one also smells of grapefruit and it's such a lovely scent. I also received the gold elixir as a free sample, I believe you get this when you spent £20 on the Revolution Beauty website and that deal is still currently on at the time of me writing this post. This product is like a mix of an oil and a serum, and it even has gold flakes in it which are supposed to brighten the skin ... how fancy?! I use this at night to give me glowing, radiant skin in the morning and it does say that this can be mixed with your foundation too!! Also, can I just add that all these products are cruelty free and vegan, just another reason why Revolution is one of or if not my FAVOURITE beauty brands out there! I am very happy with all of the products I got and my skin is looking and feeling much better in just a week.